If you are following along in order, then you just arrived from Holly Krautkremer's blog where she will fill you with amazement! This card was inspired by a top I just bought. I love blue. Really. You should see how much blue I have in my wardrobe! And this print got me thinking about how I could recreate it with this set. I hope you will give this a try! Cut a panel of Crumb Cake to 4"x5¼". 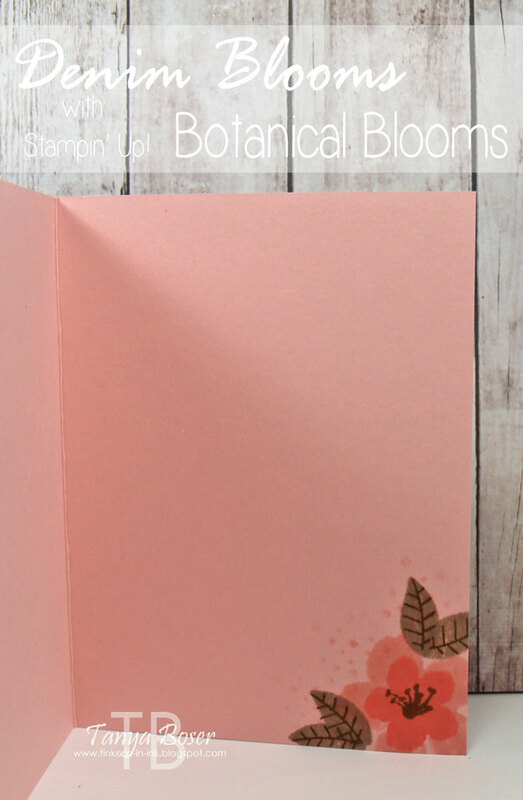 Stamp the flowers in Blushing Bride and Flirty Flamingo. Stamp the leaves in Crumb cake, and the stamens and leaf veins in Soft Suede. Dry well with heat tool. Wipe the entire panel with an Embossing Buddy. Using Versamark, stamp over all of the images again, add a sprinkling of the confetti flowers in the gap. Sprinkle with Clear embossing powder and heat set. 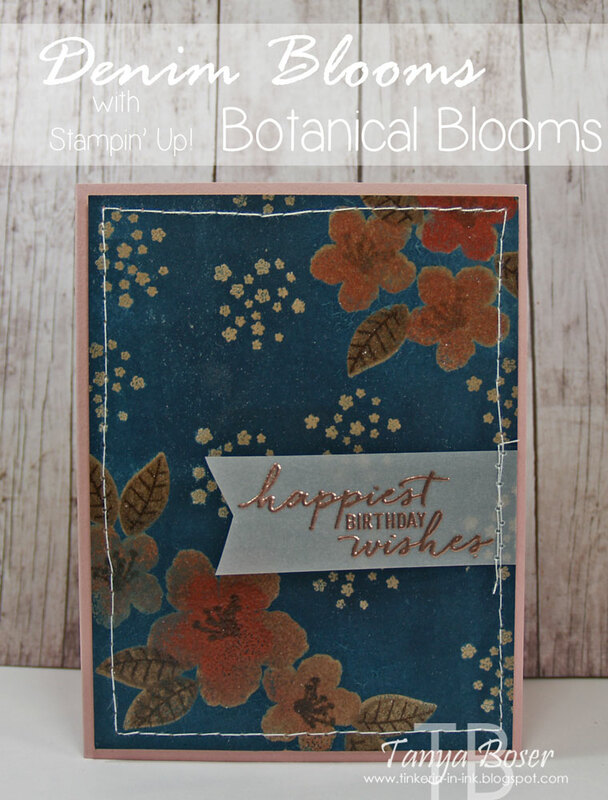 Use brayer, sponge brayer, or sponge to cover the panel in Dapper Denim ink. Then take a lightly damp cloth and rub the excess ink off the embossed areas. 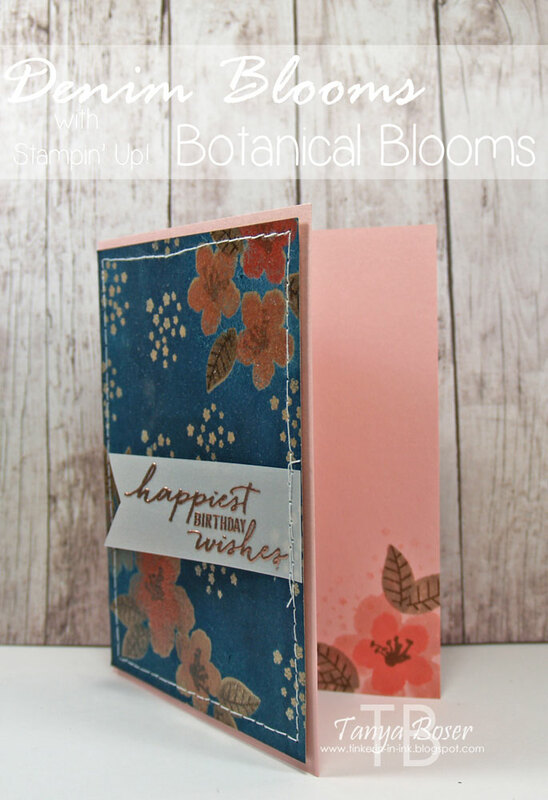 Stamp the sentiment from the Watercolor Wishes kit stamp set in Versamark on a piece of Vellum, heat emboss with Copper embossing powder, then cut down and dovetail one end. Stitch to the panel. Adhere the finished panel to a Blushing Bride card base with dimensionals (or coasters if you have them :) ). Stamp the flower and leaves inside the card in the right lower corner. All done! You can see the dimension here, and a little closer look at the flowers. Some of the Versamark stamping was not perfect, but it adds a little shadow and depth to the images, which I really love! I stamped the big flower in Blushing Bride, then layered the smaller flower in Flirty Flamingo. and the stamen in Soft Suede. The leaves are Crumb Cake and Soft Suede. I added a few stamped off Blushing Bride flower confetti images to this also. I am the last stop on this hop, but if you started somewhere in the middle, or you just want to go around again, head on over to Jessica William's blog! She is sure to knock you socks off! Christmas in July Stamp A Stack!